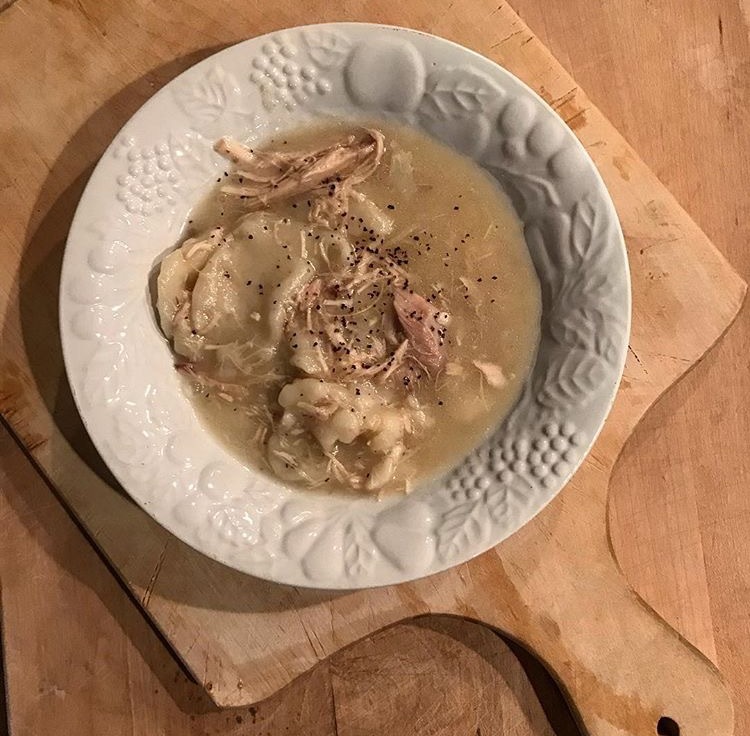 As promised here’s the recipe for the yummy Chicken and Dumplings that I posted on Instagram and Facebook yesterday. It’s not complicated, so don’t be intimidated by the steps. Here we go! Let me know how it turned out! You will need to first cook the chicken. You can do this stove top or in a crock pot. If using a crock pot you will need to transfer the broth to a stock pot and make the dumplings in the stock pot. This recipe makes about 10 servings. Add water and broth - half water, half broth. Don’t cover the chicken entirely but liquid should at least cover the leg portions of the chicken. Cook for about an hour or until chicken is falling apart. Unless you’re cooking in a crock pot, then cook on low for about 6 hours. Remove chicken from broth, let cool and debone. Before you begin, spread a good amount of the flour on a table or biscuit/bread board. You will need this for kneading the dough, keeping it from sticking to the table or board, and for rolling out the dough. Place flour in a mixing bowl, add the milk, and begin scooping the (cooled) broth into the flour. Begin stirring the mixture, adding more broth as needed until the dough begins sticking together. If you add too much broth, just add a little more flour. Continue to mix until the dough is forming together. The dough will still appear a little sticky at this point. Pour dough onto the floured table/board and begin to fold over gently while mixing some of the flour into the dough until it begins to take shape as a SOFT ball. You don’t want it to be a hard ball (otherwise your dumplings will be tough) - you just want it mixed enough to be able to roll it out. Rub flour on a rolling pin or large glass, covering well. At this point I like to divide the dough into two parts because it’s easier to handle and roll out. Roll the dough out onto the table/board. You want the dough to be thin (that’s the key). Not so thin that you can’t pick it up. I know this is an unusual reference but it should be about as thin as two business cards stacked together (crazy reference, I know, but hey country cooks have their own ways of measuring things). Cut with a knife through the rolled out dough in about 1 ½ “ wide strips. Heat the broth to boiling. Pick up the dough strips and begin breaking off in about 2 ½ - 3” pieces dropping them into the boiling broth. As you continue to add the pieces, it may be necessary to reduce the heat. Continue this process until all pieces have been added to the broth. You may need to add more HOT water if you don’t feel that you have enough broth. Add the chicken to the dumplings. Add salt and pepper to taste and stir gently. Reduce heat to medium. Stir occasionally - remember to stir gently. After about 30 minutes into cooking reduce heat to low and simmer for about another 30 minutes or so - continue to stir occasionally - gently. I have to taste to see if the dumplings are done. They should not be doughy in the middle. The texture should be consistent through the dumpling. This is not hard, I promise! ENJOY! And, let me know. Many Thanks for the Gift of Love!